Disaggregated Industries (Vernon/Topping, 2018) is a short, atmospheric, science fiction film set in the South West Cumbrian town of Millom, by Mark Vernon (http://meagreresource.com/) and Jane Topping. As two Glasgow-based artists commissioned by the Moving Mountains Festival to make a film about Ghyll Scaur Quarry, we were acutely aware of our ‘outsider’ status. So, our approach was to imagine discovering Millom, its rich industrial past and its people, as if we were aliens, sifting through audio and images that we found in the ether. 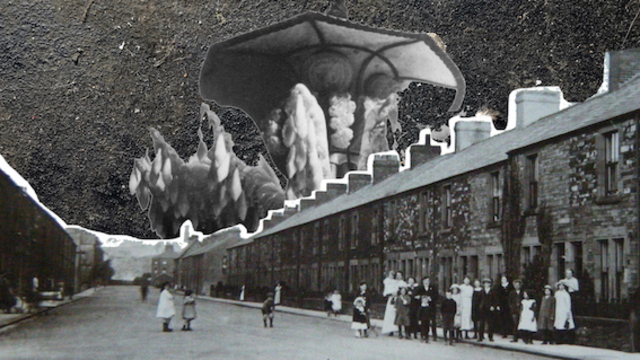 Using a collage technique, we pieced together a science fiction narrative for the town of Millom, haunted by the poetry of Norman Nicholson. Disaggregated Industries gathers together textures of the Cumbrian landscape, both rural and industrial, memories of its people and the contradictory sounds of nature and technology. The film tells the absurd tale of a strange creature, perhaps awakened by mining works or perhaps deliberately hewn from the stone beneath Millom, and the humanoid who opposes it. We follow in the footsteps of a hooded figure, literally a man who fell to earth, as he walks a rocky coastal landscape, pursuing the ominous presence which seems to threaten the past inhabitants of Millom. Disaggregated Industries is atmospheric rather than mimetic and the Cthulhu-like creature might stand in for an industrial past or a nuclear present. A fragment of a favourite Norman Nicholson poem, Shingle, appears in the film, offering layers of texture; of grey waves, of stone and of butterbeans.